In the summer I ate at the Grain Store near Kings Cross. When it opened it got a lot of plaudits for giving vegetables the same weight as meat on its menu. To read some reviewers, you’d think it was ushering a whole new era of vegetable-centred food. *Looks around* Yeah, that so worked! Anyway, they do have a higher than normal number of veggie options on the menu and when I was there I had the Chilli con Veggie. 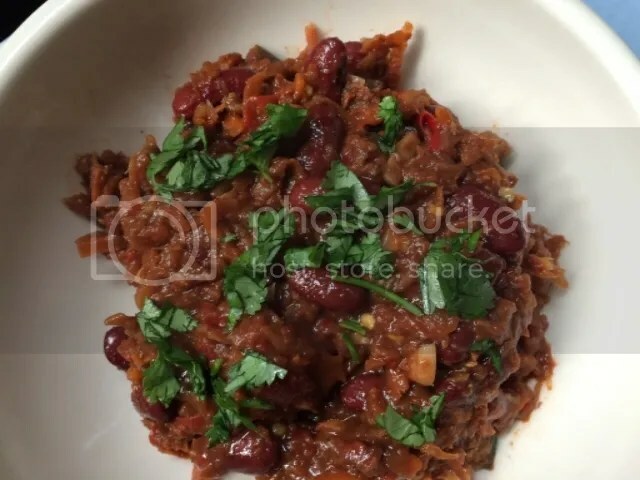 I was impressed because they produced a thick, satisfying chilli with no use of meat substitutes, just vegetables. I didn’t really have a clue how to emulate this until I watched a TV series Kew on a Plate where Raymond Blanc cooked the produce of a splendid kitchen garden. He produced a chilli that was pretty much made up entirely of grated vegetables. Now I knew what to do. This is great. It is everything I wanted it to be – hearty, satisfying and with no fake meats in sight. I suspect it will do a lot towards your five-a-day within one serving. Soak the dry kidney beans overnight. Drain, and add to a saucepan, cover with water. Bring to the boil and boil hard for 10 minutes. Reduce to a simmer and cook for 45 minutes or until the beans are tender. When cooked, drain but reserve the cooking liquid. Grate the onion, carrots, fennel, pepper, celery and aubergine. Heat a little oil in a large saucepan. Add the garlic and chilli and stir for a couple of minutes. Add the grated vegetables to the pan and stir. Cover and sweat gently for 10 minutes. Add the cooked kidney beans. Add the chopped tomatoes and fill the empty tin with the juices from the cooked beans and add to the pan. Add the tomato puree, marmite, mushroom ketchup, ground cumin, smoked paprika, chilli flakes and the cocoa powder. Stir thoroughly, bring up to the simmering point and simmer, uncovered, for 30 minutes. Serve with a sprinkle of coriander leaves over the top. This goes well with rice or crusty bread. This is a lovely, warm, sweet pasta sauce. It’s fine on its own or it could be used as a base for other ingredients, garlic, chilli, balsamic vinegar, olives or all four! Arrange the peppers, tomatoes, onion and carrots on a lightly oiled roasting tin. Place in the oven for 30-45 minutes or until the carrots are soft and everything is nicely browned around the edges. Put the vegetables in a blender and blend to a smooth paste. This sauce needs only reheating while the pasta cooks and a sprinkling of basil as it is served. Ah, late summer (or early autumn depending on your point of view), when the pumpkins and squashes hit the veg boxes and I wonder what I’m going to do with them. 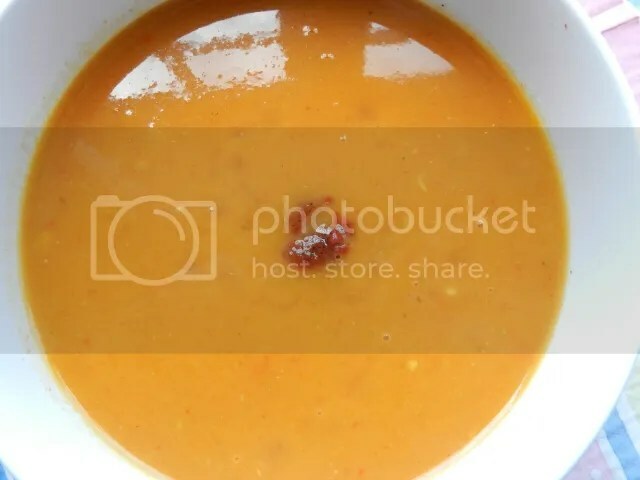 Let’s get the obvious one out of the way first – soup! Pumpkins (like their cousins, courgettes) make great soup. They blend to a wonderful smooth, creamy texture and they add a background sweetness that never really overpowers anything they’re in. This recipe calls for roast pumpkin and if you’re going to put the oven on to roast one vegetable, you may as well roast a few at the same time. Unusually for me, this is a more liquid soup, rather than the thicker ones which are my forte. Put the pumpkin pieces, peppers and tomatoes on a shallow roasting tin, drizzle with the olive oil and sprinkled with black pepper. Bake for 45 minutes until they are all charred round the edges and the pepper skins are blackened. When cool enough to handle, remove the skins from the tomatoes and pumpkin pieces and the skins and seeds from the peppers. Sweat the onion and garlic until they are softened and translucent. Stir in the coriander, cumin and paprika. Now add the tomatoes, pumpkin pieces and peppers to the saucepan. Pour over any of the juices from the roasting tin. Pour over the vegetable stock. Bring to temperature and simmer, covered, for 30 minutes. Remove from the heat and blend to a smooth consistency. Check for seasoning and serve with a little drizzle of harissa paste and a squeeze of lemon juice. This is a great vegetable-packed pasta sauce that doesn’t feel like you’re eating a lot of vegetables in it. It has a deep flavour (aided by the balsamic vinegar), but the effort required is minimal. 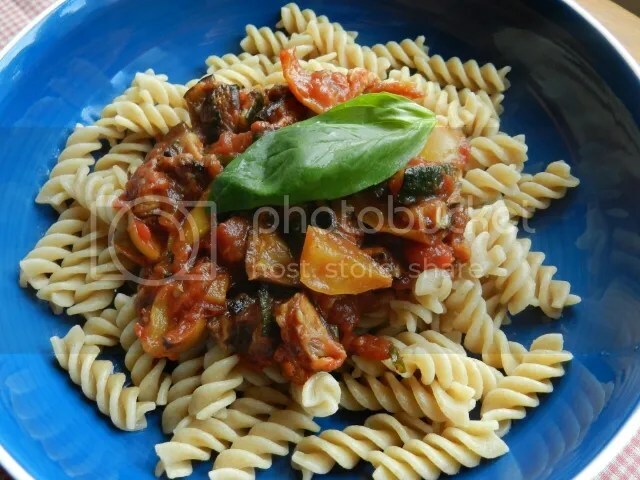 You could even roast the vegetables the night before and then this is a quick pasta sauce that can cook while the pasta is boiling. Spread out the aubergine, pepper and courgette over one or two baking trays. Toss the vegetables in the olive oil until they are all coated. Wrap the garlic cloves in a square of kitchen foil and put on one of the trays. Cook the vegetables for about 30-40 minutes. Once the vegetables are cooked, scrape them into a saucepan. Squeeze out the roasted garlic cloves into the pan. Add the tomatoes, balsamic vinegar and one tablespoon of the basil leaves. Serve with pasta, with the remaining basil leaves sprinkled over the top. This is a Chinese whispers of a recipe. A friend of mine got it from a friend who got it from a friend who might have got it from a Slimming World or Weight Watchers meeting. No one seems to have written it down, though. And each person seems to have fiddled around with it. Mine is a vegan version – the friend who passed the recipe to me eats meat. And she likes chilli – I prefer paprika’s smokey taste. 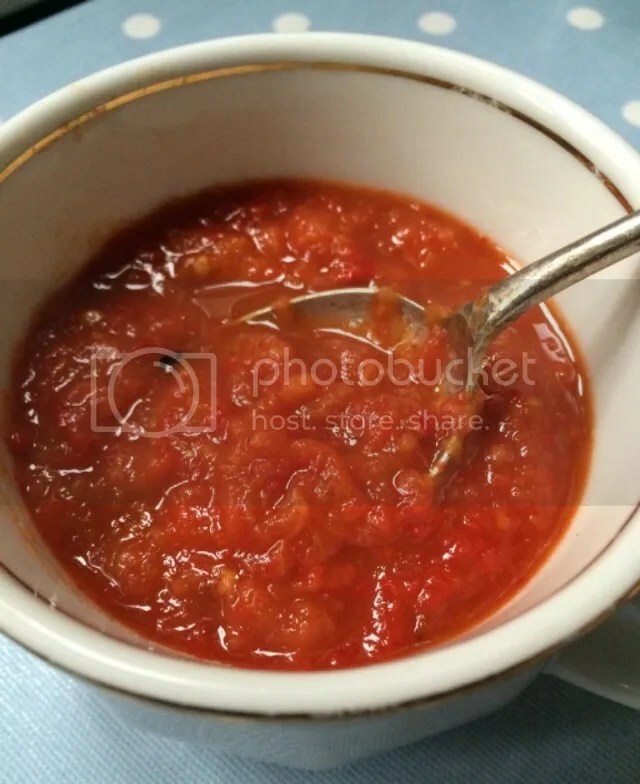 She didn’t use tomatoes – I thought it was a bit bland and dry without when I made it the first time, so added tinned tomatoes and chucked in a bay leaf second time around. That pepped up the creamy butter beans no end. Anyway, go ahead and fiddle to your heart’s content. 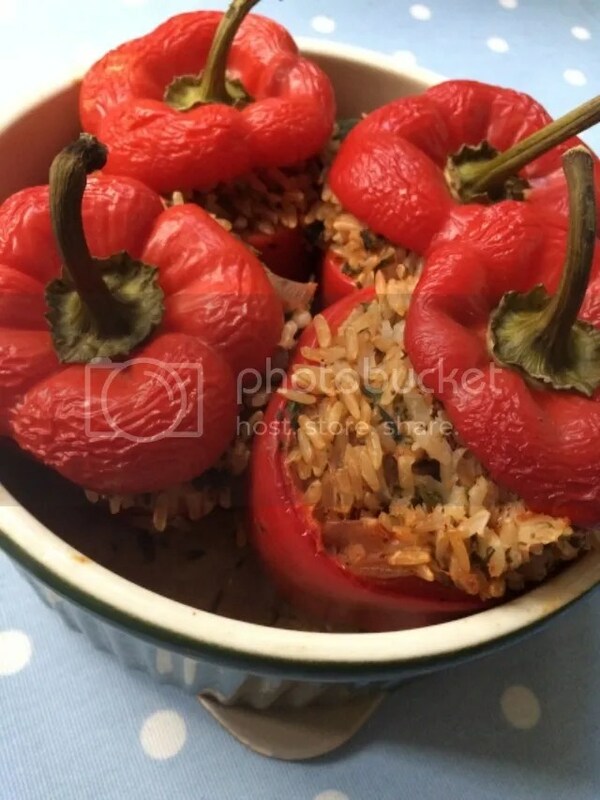 It’s very simple, has a pleasing texture and really benefits from good paprika. In fact, the hardest part of the recipe was getting my posh new tin of Spanish paprika open without showering it over me and the kitchen! Sweat the onion and red pepper in a little olive oil/olive oil spray, depending how healthy you are trying to be. 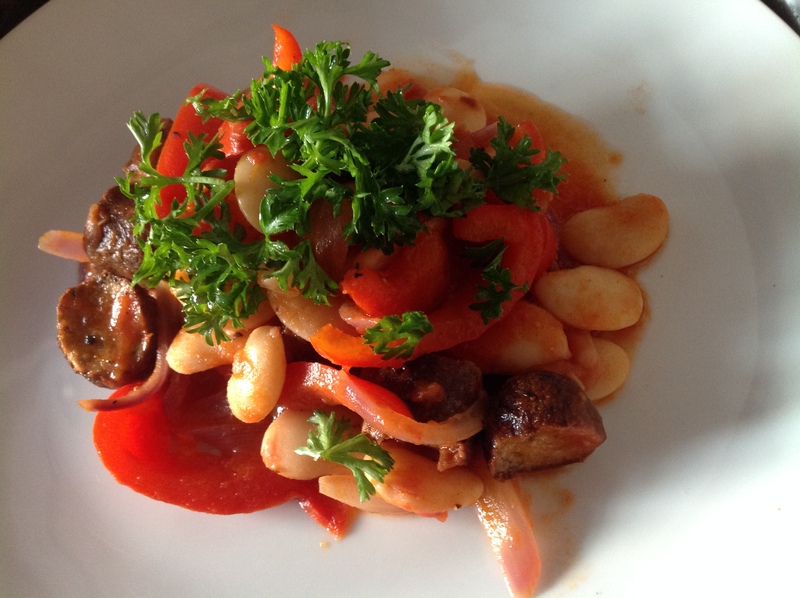 Tip in the butter beans and the chopped tomato, add the bay leaf and cook gently. In another pan, fry the sausages. When they’re done, cut them into bite-sized chunks and add to the main pan. Add the smoked paprika and the other seasoning. When everything is warmed through, fish out the bay leaf and serve with chopped parsley. I paired it with baked potatoes, but creamy mashed potato would work nicely as well. 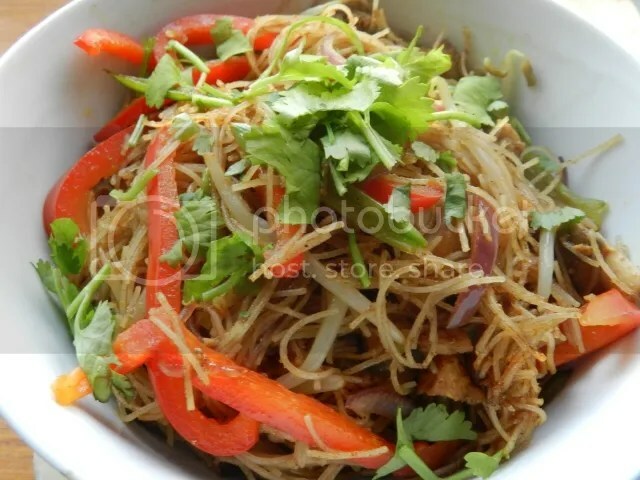 Singapore Noodles or Singapore Style Vermicelli has long been a favourite of mine from Chinese take-away menus. Wanting to make the authentic thing I asked a Singaporean friend of mine for the recipe. She’d never heard of it. It turns out it’s a Cantonese dish, so here’s my inauthentic version of something that was never really authentic in the first place! Tastes great though. A few notes about this. I’ve used the packet cooked noodles you can find next to the salads in most supermarkets, but you can use the dried rice noodles if that’s what you have (cook them according to their packet and then let them go cold). I’ve used more oil in this than I normally would in a stir-fry, it shouldn’t be swimming in oil, but you need a fair amount for it to work. I’ve put more vegetables in this than I normally see in a take-away version, but this should remain a noodle dish rather than a stir-fry vegetable dish. This recipe is for one. When I’ve tried to make this for two it’s ended up as a soggy mess. I think that’s because domestic woks and cookers just don’t get hot enough. If you’re cooking this for two – make one and then do another batch. It takes less than five minutes to cook anyway. Heat a wok and then pour in the oil. When the oil is really hot, add the vegetables and stir for a minute. Add the rice wine and stir for another minute. Add the curry powder and stir until all the vegetables are coated in it. Then add the noodles and the soy sauce. Stir for a couple of minutes until the noodles are heated through and are coated in the curry sauce. Serve with the coriander sprinkled over the top.